Ok.. I dont know what it is but I am FREAKED! First of all….. One of the struggles that we have in Australia is to understand American terminology. In all things, not just crochet. What Aussies call crisps, the US call chips. Aust : Lemonade; US : 7UP. Aust: Scones, US : Biscuits. Aust: Biscuits, US : Cookies. Then we have different clothing and shoe sizes which makes eBay shopping sometimes far more amusing than it should be. but I’m actually kind of glad that I don’t. 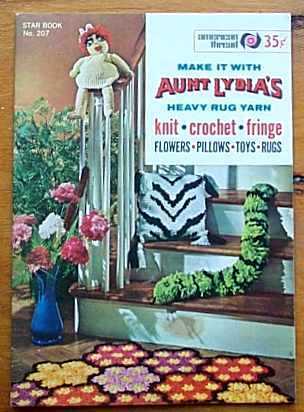 The rug is ok for a given value of “ish”, the zebra cushion – maybe – if you’re into that kind of thing… I’m hoping the flowers arent a demonstration of heavy rug yarn but the green snake thing is really tipping the fugometer! What’s giving me the serious heebeegeebees is – I’m unsure what sort of recreational pharmeceuticals the creator of the Doll thing sitting on the bannister was ingesting at the time that led to the freaky whacked out expression it’s got going on… Give that to a Child this Christmas, and you better be giving the parents some high-piled dosh to cover the therapy that freaked out munchkin is going to need. This is perhaps why you shouldn’t crochet whilst watching a Bette Midler Marathon?